December 6th is Saint Nicholas Day. My Albuquerque friend, Kathy Chilton, has a family tradition where everyone writes a letter to Saint Nicholas on the eve of Saint Nicholas Day, telling him what to bring them for Christmas. One year, Kathy had a houseguest from Nepal, who had never heard of Santa, but who was willing to write a letter with the other family members. When everyone was asleep, Kathy and her husband read his letter. He asked for a picture of Santa in a glass ball, so he could show his family in Nepal when he returned. Kathy realized he was asking for a Santa in a snow globe. She looked everywhere but could not find one. Reluctantly, she got him a practical Christmas gift instead. On Christmas Eve, Kathy always had a dinner at her home, asking the guests to bring a Christmas gift. One guest brought a gift for the man from Nepal. 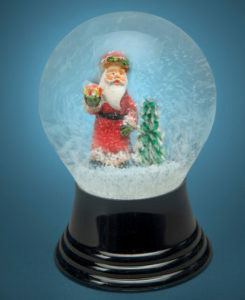 She said to Kathy in the kitchen, “I don’t know what he’ll do with it, and it’s a bit heavy, but…” To Kathy’s amazement, it was a Santa in a snow globe. Now Kathy says she believes in Santa Claus. That story and many more are in the book about my shop, Susan’s Christmas Shop. Santa Fe is starting to look like Christmas. 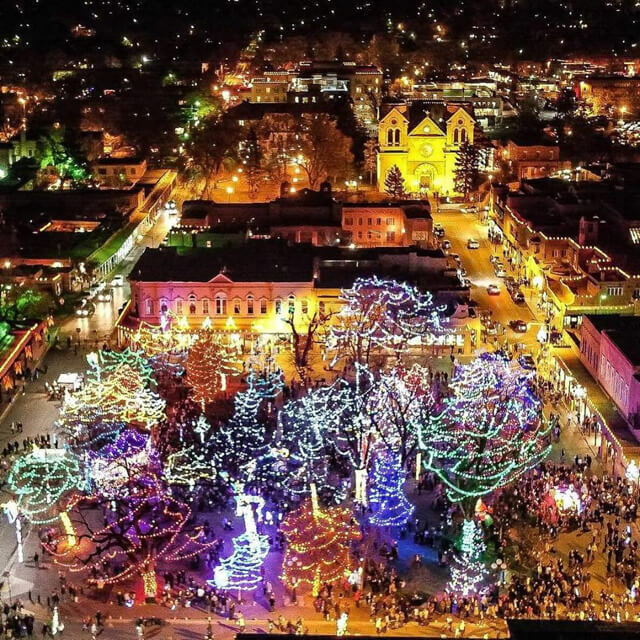 The electric lights in the plaza trees were dramatically lit the night after Thanksgiving, preceded by a loud countdown by the crowd on the plaza and followed by great cheers. It’s all fun, but it was a bit like Time Square with so many brightly colored electric lights. The quietly burning candles nestled in sand inside their paper bags on the ground were overlooked, even trampled on by the enormous crowd on the plaza that night. I’m glad I have seen Christmas displays in past years where the serene beauty of hundred of glowing luminarias or farolitos inspired awe, quiet contemplation and anticipation, heightened by the fact that the beauty was only for a few hours and would disappear by dawn. Sunday night was Las Posadas on the plaza. The Santa Fe plaza version has included the role of the devil since 1982 when the neighborhood on San Antonio Street agreed to perform their unique version on the plaza. 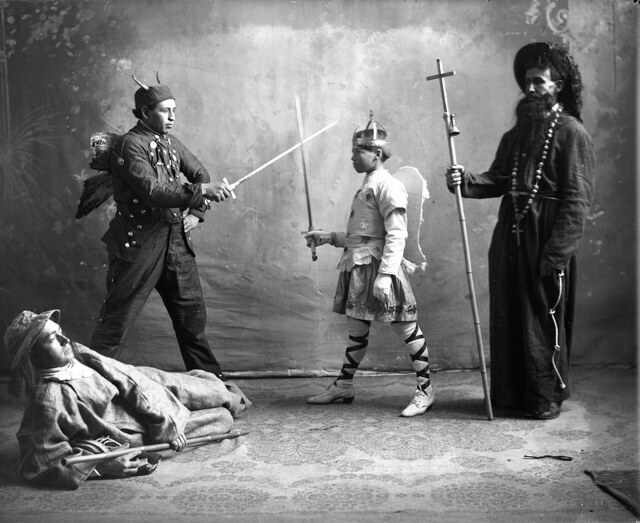 The devil character was borrowed from another Spanish Colonial play Los Pastores. Saint Michael fights the devil in this play and always wins. A group from Belen, New Mexico, will perform Los Pastores at the convention of nativity collectors in Santa Fe next November. They own a rare script from New Mexico’s colonial days. Belen is the Spanish name for Bethlehem. Last year, the devil’s role in Las Posadas on the plaza was censored and expelled, and the public missed that comic feature. This year, the devil’s role returned to delight the crowd as it followed Mary and Joseph around the plaza, looking for room at the inn. Finally, they all entered the courtyard of the Palace of the Governors for an hour of wonderful local, live Christmas music in English and Spanish under the stars. Don’t miss this event if you are in Santa Fe. 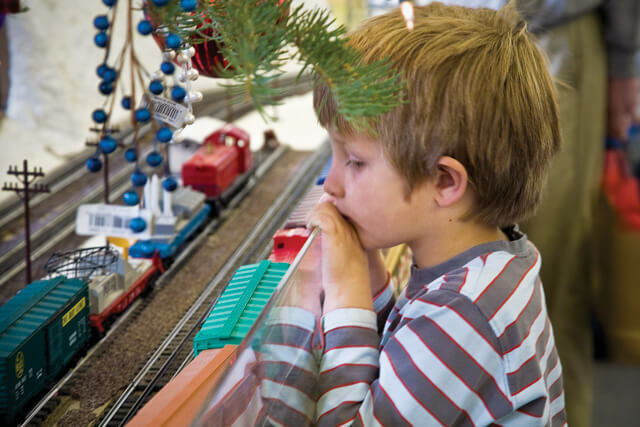 The model train in the lobby of First National Bank on the plaza begins running today, delighting children of all ages till Christmas. Here is an engineer I know. 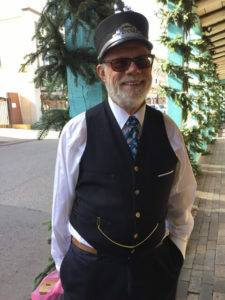 He’s wearing a real Rio Grande Railroad hat, and his vest is real railroad uniform too. Does this make you want to come to Santa Fe at Christmas? If you live too far away to do this, I send my affectionate greetings, wherever you live in this wide world.